In his book 'Against Happiness: In Praise of Melancholy' prof. Eric G Wilson makes a case for being sad. He states that melancholy can be a powerful and creative force, a force that has inspired some of the most creative minds in the world of art and music:....."There is a fine line between what I’m calling melancholia and what society calls depression.....what separates the two is degree of activity.....Depression causes apathy.....In contrast, melancholia generates a deep feeling in regard to this same anxiety, a turbulence of heart that results in an active questioning of the status quo, a perpetual longing to create new ways of being and seeing." 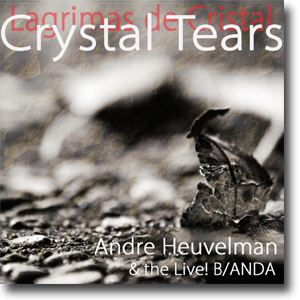 Andre Heuvelman has collected 9 melancholic compositions. The compositions span a period of 400 years yet they all have that feeling of sweet sorrow. Andre and his band has carefully cut to the bone of each melody by using a very sparse instrumentation. As a consequence the voice of each instrument has to carry it’s full weight but it also makes it very easy to distinguish each voice. Sometimes I just let the them. Tears emerging from old pain or new joy. Embracing the incapacity. Incredible valuable. Genuine tears appear out of nowhere, just like my music; starting like a ripple, evolving into emotion. Without assumptions, pure and with full permission. A tone that always finds a way, just like water. My tears, that always ask a question, as they are the mirror of my soul. Crystal clear from a purifying source. Crystal tears my souls muse. Frans de Rond has created a wonderful warm sound stage, letting the instruments appear up close and personal, like a good friend reaching out for your hand. Crystal Tears was recorded in the legendary Studio 2 of the 'Muziek centrum van de omroep'', the music studios of the Dutch Broadcasting company. Except for Passacaglia remix, the 10 pieces of music were recorded live in the studio. The musicians were placed in front of a stereo pair of microphones with additional spot microphones on each instrument. The musicians were playing without headphones, the reason being that we believe that when we get the musicians to play together in the same room, without headphones, it creates a number of musical and technical benefits: As they are not ''separated'' by the headphones, the musicians are forced to create a natural and musical balance, a balance which is then easily captured by the main stereo pair of microphones. Because of the musical balance the need for compression to control levels is no longer necessary. Since everybody is in the same room, the boxed sound which is so common in many modern recordings is absent and the sound of the room helps ''glue'' the sound of the recording. This is all very well but there are also problematic aspects to this procedure: The studio has to have a good sound. The musicians have to be very good and well prepared as it is very difficult to repair mistakes because of the ''cross talk'' between the instruments. We have to be very precise when placing the microphones, and the puzzle of placing the musicians at the right distance to the main stereo microphones and the right distance to each other, is also time consuming. Studio 2 has remained in its original form since it was built in 1929. The studio has a unique warmth and depth, which we have not encountered anywhere else. With a decay of 0.8 seconds the room is perfect for chamber music and jazz ensembles. The recording was done in 96kHz-24bit PCM.